Gaelcholáiste Chéitinn is an autonomous Irish language unit within the CTI. Our school, meanscoil lán gaeilge, Gaelcholáiste Chéitinn was named in honour of the renowned Tipperary born poet, scholar and historian Seathrún Céitinn (Geoffrey Keating 1569 – 1644). 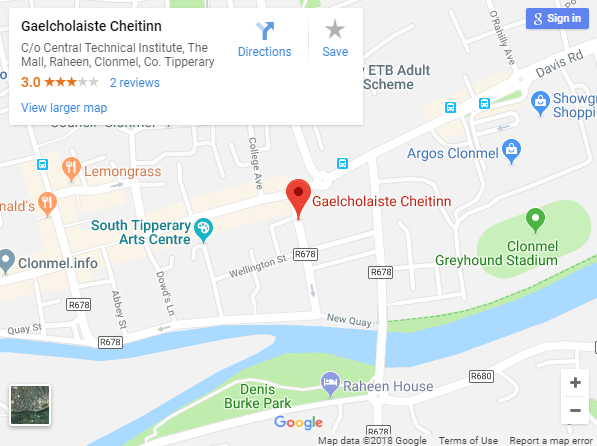 The Gaelcholáiste was formally established in September 2004 with a three-year probationary period with a view to providing second level education through the medium of Irish for the students of Clonmel, Carrick-On-Suir and surrounding areas. At its opening the Gaelcholáiste had 14 first-year students: thirteen boys and one girl. Eleven of these, including the girl, came from Gaelscoil Chluain Meala. The remaining three students came from different primary schools in the area. By 2006 the Gaelcholáiste had 26 students. It was officially opened in 2009, having at that time an enrolment of 95 students. The building is located at the Mall, the site of the old CTI building. A carving of the poet Seathrún Céitinn completed by our woodwork teacher Mr Slattery here in Gaelcholáiste Chéitinn. The Gaelcholáiste crest, in gold, shows the seated figure enclosed in the Gaelic letter “G” of an ancient Irish monk copying a manuscript. The idea for this crest came from the design of the old halfpenny stamp. The crest itself was designed by Edmond Ryan of the art department here in CTI. When the Gaelcholáiste opened both the then Principal, Charlie McGeever and the then Vice-Principal, Shane Hallahan, taught in the Gaelcholáiste, along with the then Múinteoir i bhFeighil, Mathúin Ó Caoimh. An t-Úsal Ó Caoimh was the first Múinteoir i bhFeighil, and played a key, and much understated leadership part in the original and on-going development of the Gaelcholáiste. In 2013 Mathúin Ó Caoimh retired and Lorna Ní Ghallachobhir took over as Múinteoir ibhFeighil. Numbers have been steadily increasing in recent years with a current enrolment of 143 students. This is in no doubt with thanks to our two main feeder schools: Gaelscoil Chluain Meala and Gaelscoil Charraig na Siúire. We also have a continuously growing number of students who come to us from a number of different English speaking primary schools from around the locality. These schools include Ballymacarbry N S, Newcastle N S and Powerstown N S to name but a few. We as a school take great pride in and celebrate all aspects of our Irish culture and we put great emphasis on Irish music, Irish drama and debating through Irish. We also excel in the Irish games of hurling and gaelic football. The success of the Gaelcholáiste to date is due to no small measure to the dedication and professionalism of the staff and the friendly and caring attitude towards the students.